“Klaus” Photo by Viviana Zuluaga. Klausâ€™ sharp blue eyes greet us; he is as fascinating as the walls he lives with.Â Klausâ€™ resume is sketchy, to say the least. Born in Germany, he has lived in the United States for over 30 years. At the age of 20, he visited New York City and worked as a mechanic on French automobiles.Â Later he shipped out as a merchant marine. He jumped a train to Pennsylvania where he worked for a well-known developer and realtor in West Chester, the county seat of Chester County. Â The developer gave Klaus a job at a bed and breakfast. 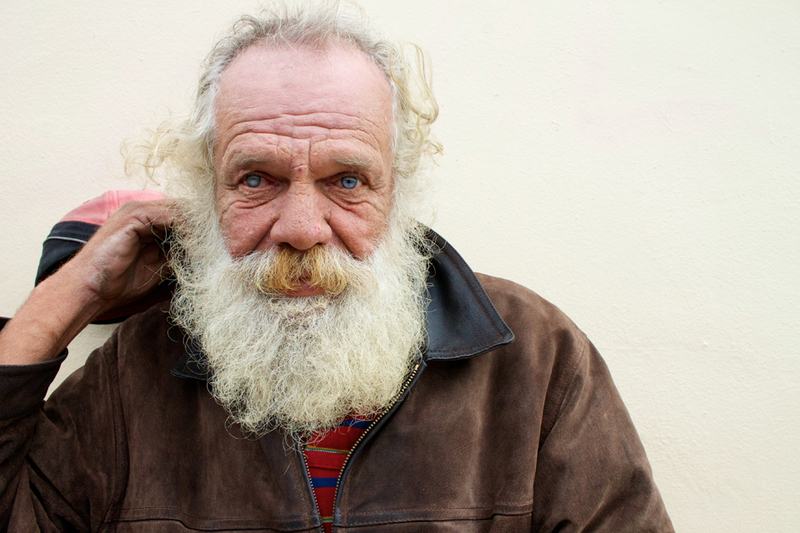 Klaus is presently a street-person and member of the Wynwood community. As a keen observer of Wynwood machinations, he speaks of plans for new private art schools and 10-story buildings. When asked if heâ€™s ever been inside Wynwoodâ€™s colorful buildings, he answered by talking about the many residents and business owners he helped move out of Wynwood because they could no longer afford to keep their businesses, homes and art galleries in this transitioning neighborhood. â€œYou have to make a lot of money to be in this neighborhood. Big galleries from Europe and around the world are making their big-time money in events like Art Basel.â€Â Klaus doesnâ€™t see the upscale shift in the development of this area as the death knell of the art displayed on Wynwoodâ€™s walls. We asked what he thought about the graffiti on the walls of Wynwood and if he thought they were a fad that would disappear someday.Â â€œNot really,â€ Klaus said. Â â€œGraffiti will never die . . . people come from around the world to see this art and there is an actual graffiti competition.â€ Due to the international recognition these graffiti artists are garnering, Wynwoodâ€™s painted walls will always be an important identifying element of what makes Wynwood special. Klaus sleeps on the streets of Wynwood. His territory is not marked by thresholds or defined volumes, but rather by the stories painted on the walls. The powerful meanings and influences of the images painted on the walls of Wynwood motivated Klaus to become a guardian of the art. 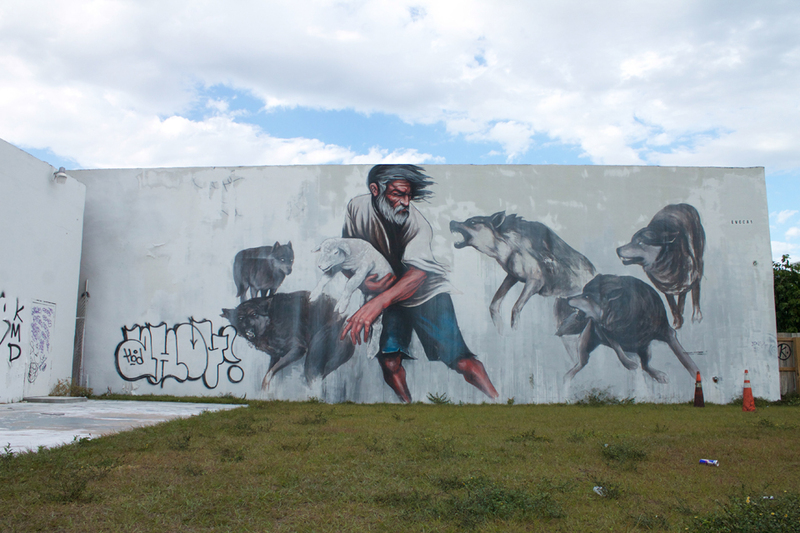 Klaus is perhaps most connected to a mural by Evoca1, a local Dominican figurative painter. The piece is called â€œRunning with Wolves.â€ Â To Klaus this painting is important because itâ€™s about saving life. Our physical surroundings are tangible only through the lens of human perception. For some people, the large-scale images on Wynwoodâ€™s walls donâ€™t fully represent the community that has lived in Wynwood for years.Â For some people the graffiti has become more like scars that mark the passage of time and the shift in the identity of Wynwood. Inside of a building on the corner of North Miami Avenue, just a few blocks away from where we spoke with Klaus, a restaurant owner, born in Connecticut, mother of six, holds her new born tight as she greets us with a smile. She moved her business to Wynwood in 2011, and has lived in a high-rise apartment building not too far away from her restaurant. When asked about her thoughts regarding the development of new high-rise buildings in Wynwood she said, â€œIts great for business because more local customers will dine here.â€ Â We then asked if the interior design of her restaurant relates to the exterior faÃ§ade of graffiti. She responded with a smirk, â€œNo way. There are cooler things happening in here then out there.â€Â â€œDo you think the elaborated walls affect your business?â€ we asked. Â â€œNot really, because itâ€™s not why people come to eat and hang out here,â€ she replied. She views the graffiti as a tourist attraction that adds profit to her bottom-line. But just like Klaus, the graffiti has an overwhelming presence that directly impacts both psychological and physiological aspects of her life. Wynwood has shed its colorful skin many times — from the time it was established as farmland, to the time it was known as â€œlittle San Juan,â€ to its current incarnation as a concentration of galleries that may help Miami gain global recognition as a world-class art community. The Wynwood we all know now is a diverse community with walls that serve as canvas for individuals to tell their story, to voice opinions on social and economic issues, and showcase artistic talent. Caan, Shashi. “Being.” Rethinking Design and Interiors Human Beings in the Built Environment. London: Laurence King, 2011. 38. Print.